Uh-oh. 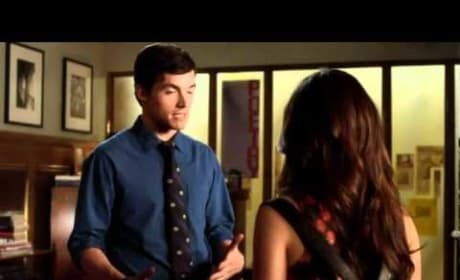 Aria does NOT like what she witnesses in this scene: Ezra is interacting with an old flame. Things are about to get awkward in the Montgomery household. Check out this sneak peek at the episode "Surface Tension." "You don't have to fight all of my fights." That's what Caleb says to Hanna in this clip from Pretty Little Liars. Will Aria and Ezra finally go public? They discuss this topic in a scene from "Surface Tension." 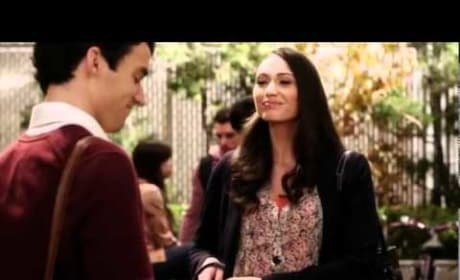 Spencer and Mona are backstage at a fashion show in this clip. It's courtesy of the episode "Never Letting Go." Noel also makes an appearance. Well, this is awkward. Aria meets Jackie again in this clip from the Pretty Little Liars episode "The Devil You Know."